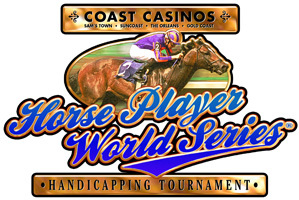 The Horse Player World Series (HPWS) is fast approaching, so we’ve scheduled a major HPWS qualifier on Sunday, March 16, that stands to award a major number of HPWS entries to players at HorseTourneys. The HPWS “Blowout” contest on Sunday, March 16 will award one $1,000 entry to the HPWS per FIVE (5) players participating. That’s a 20 percent chance to earn an entry to the HPWS two weeks prior to the event, which will be held March 27-29, 2014, at the Orleans Hotel and Casino in Las Vegas. Entries fees to the HPWS Blowout event will be $235 with up to three (3) entries allowed per player. Direct Feeder events to this contest will be held Wednesday through Sundays beginning Feb. 5 and running through the event on March 16. The Direct Feeder events will carry entry fees of $52 and will award one $235 entry to the HPWS Blowout per FIVE (5) entries participating. So again, players will have a 20 percent chance to earn a $235 entry into the HPWS Blowout event per Feeder event. If you have any questions on this contest or the feeders, please contact us at support@horsetourneys.com.